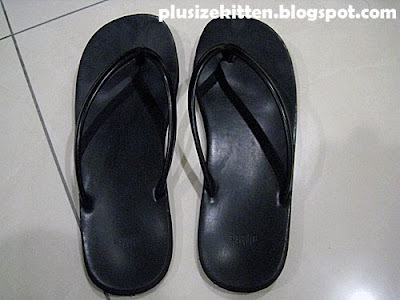 About last month, I bought a pair of black sandals from M)phosis, Isetan KLCC. It was discounted, so I paid roughly rm40 or rm50 for it. After wearing the sandals, my feet started becoming the color of gray/black. I was even scolded by my fiance why my feet was so dirty. I wash my feet so many times it's still grey/black! argh! Finally I realized it's the black sandal that I was wearing! is this common? 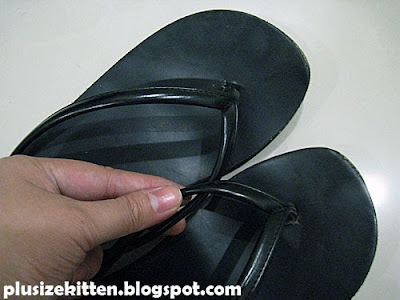 black sandals that stains your feet? It's my first time experiencing such thing! truth be told I'm quite TRAUMATIZED by this! I bought & wore many sandals before and this is my first time being "stained" by one! I don't usually become angry... I gave the sandal a probational period to clean up its act but this seems to be a permanent problem with this sandal! I don't like having my feet becoming "blackish" and going to foot spas showing the reflexologist my black/zombie feet? If it was easy to wash off, I won't be complaining like this! It's so hard to clean off! I have to scrub and scrap it off my heels! 2 black strips are on my feet bcoz of the straps too! ARGH! dyes/stains gets into my nails & corners! Anyone know how I can contact n make a complaint to M)phosis for this? I think this is not safe at all for consumers! the dye = chemical! stains = no good! what happens when it gets into my blood system or whatever u call it? I think this is a very serious issue, what happens if someone is allergic to such "dyes"? What happens when my dog chews my sandal n dies? I'm not sure what material this is? what's the material of the shoe? velvet shoes do leave stains! hi miu sorry to hear this. I read and I laugh so sorry... can't help it.. first time to know such case. yeah so true cannot sell such product to consumer dangerous if dog chew it. Dont know that brand you mention as seldom go KLCC. maybe check your receipt see if there is a contact to call. i had a bad case of infection once when i wore lewre patent leather shoes. it was their best selling items since it copies the ferragamo looks. anyways, my feet were burnt and they are still 'blackened' till today. i suspected it was due to the chemical used in the tanning of the leather. i bought it at full price and managed to get a refund from lewre after writing in with photos evidence. i don't buy their shoes until today no matter how enticing they look to me. sorry la, i know u traumatized but "ZOMBIE FEET" ????!!!!!! Lyn: the material is kinda synthetic.. a bit like plastic nylon rubber... urm... don't think it's velvet or leathery.. not sure..maybe it's plastic leather? if there is such a thing. Sherry: now don't u laugh even more with the pictures! anonymous: gosh can u fwd me a copy of that complaint letter so I can write one to M)Phosis about this too?! I'm seriously piss. Pigita: look at the pictures! and I'm not even showing how it looks like under my cracked hell/sole. Sherry: big problem, I don't even know where is my receipt now. It was just sandals.. didn't think such a brand (which is not even cheap) can do this to me! OH no! I had a pair of cheap slippers do that to me once. But it was in phuket and I tossed it soon after. Try a foot soak with some bath salts like the ones in daiso. I think there might be anticeptic ones. If you paid with your creditcard you can use the bill as proof because the transaction number can be tracked from there. Even if u dont load them here, you MUST take photos of your soles. Then I suggest you bring the photos and the sandals to complaint to Isetan even without the receipt. 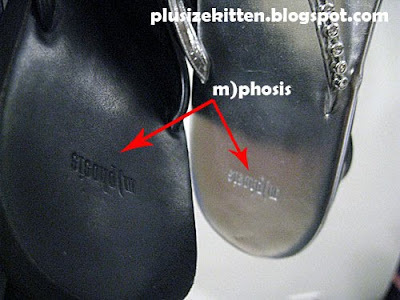 If M)phosis shoes are only sold through them, then definitely they should give you assistance even without the receipt. Anyway as an Isetan member, all purchases are recorded when your Isetan card is swiped so if u can recall an approximate period of time of purchase (they also should have records of sale dates anyway), they should be able to trace your purchase. I am sure that the particulars recorded by Isetan will at least categorize what goods you have purchased, it's not only to give your reward points, such data is likely to be used for analysis of customer purchasing patterns for their marketing/sales/purchasing dept. At the minimum, ask them to give you M)phosis' manufacturer or distributor's contact - their purchasing dept will have the details. I have always found that Japanese companies' customer service very good. If you approach them I think they will try to help you. For removal of the black marks, i think you will need to use the calloused skin remover for soles but slowly over a period of time. But dont do this at all until you have shown your zombie feet to Isetan apart from the photo evidence. use that metal rough skin remover file - not sure what it's really called, the one used during pedicures. Easiest and best i think is to go for a pedicure and let the therapist remove the dyed skin of the sole. Do take up with Isetan. sorry about me laugh,I know someday maybe my turn. how bout wash the shoes you bought? just write a simple letter of complaint detailing what happened together with pictures of your feet and copy of your receipt. that should be enough for the shoes company to refund you. this is really not good. I've heard a lot of news saying bad sandals that can makes your feet rots. ok not rot i mean but still! Miu u have to stop wearing the sandals already (no more probation for the sandals). if you really wanna wear put on socks to wear? hehe.. so just stain the socks not your feet. apart frm raising the matter w the company concerned (Janice hs given the number above - fantastic! ), I still think u should officially complain to Isetan. Let them know the quality of this brand's product questionable. try clean the leg with lemon ?? last time i also kena before use a lot method only can remove. i bought the same pair! i know this comment is abit too late. but totally agree on it. it does stain the side of my feet which wasn't too bad (yet) but this slipper could crack skulls, not kidding. And it's the sole part that is slippery, not the bottom. u too!! omg..this such a long post..i forgotten about this episode..! now reading, makes me angry again!